Can I set up Solr on a separate machine? Yes. To do that you will have to open the port on your iptables (if it is running). Then configure Tomcat to listen on that address and port in your configuration file. Then you have to set up authentication (probably just basic authentication using a Realm) for your Context. Why not just use multi-core Solr? You can and should use multi-core Solr if you are setting up commercial hosting and you have the technical knowledge to set-up separate Solr cores. Multi-core Solr would likely use less resources too. The set-up I describe works fine for a few Drupal web sites and can be maintained using files provided by the project maintainers. If you are only supporting a few sites (like maybe 3) I wouldn’t bother trying anything more complex. I have heard that Sun’s JVM works better than OpenJDK when running Solr but I haven’t had any problems running OpenJDK. I have been running a couple of small Solr instances for over a year on OpenJDK and Tomcat 5.5 without any issues related to the JVM. Can I use Solr version X (instead of 1.4.X)? I have no idea. ApacheSolr recommends Solr 1.4.x in the release notes and unless you need additional Solr features only available in later versions, I recommend that you stick with the supported version. Will this work on my busy web site? Drupal is very flexible and if you mostly publish content and occasionally your users search for stuff, then the demands on your search service will be minimal and my set-up would probably work fine. If you run a search service and index other websites by scraping and republishing scraped content in Drupal, then your search is going to get a lot more use since it is the primary feature. In that case, you would probably be better off running Solr on a dedicated machine (or machines). Why is my Tomcat on port 8983? Jetty is likely listening on port 8983 (were you following the Solr tutorial and left it running?). Make sure that you are running Tomcat and that it is listening on port 8080. Like it says, your Drupal install couldn’t find the Solr server. Check your Drupal settings. If they are not exactly right you will see this error. Check your system using “netstat -anp” and “lsof -i” run as root. Make sure that Tomcat is listening on port 8080. Check your logs. Why doesn’t my set-up work? There are a lot of reasons why your Solr set-up isn’t working. UNIX is very good at telling you when things go wrong by writing everything in its logs. Check your SELinux settings using sestatus. Check your audit logs. Check your web server logs. Check your catalina.out log. Try Googling the error codes or the main body of the error message. I’m always glad to hear from readers via comments here on the blog, or by trackbacks or via email. 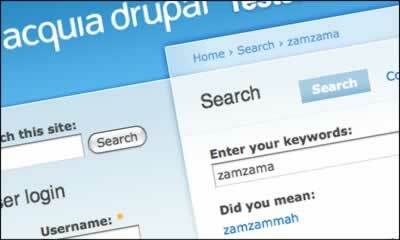 ApacheSolr for Drupal 6 improves on the out-of-the-box search experience for Drupal users. The easiest way to get Solr running on your Drupal web site is to use the hosted service provided by Acquia; it is way easier than running your own Solr. You simply point your queries to their Solr server and you’re done. For various reasons, you might want to run your own Solr web service on your own machine. In this article, I will walk you through setting up a working Solr installation using Tomcat 6 on CentOS 6. The end result of this walkthrough will be two separate Solr indexes (via two separate Solr web apps) for two different web sites running on a single Tomcat. 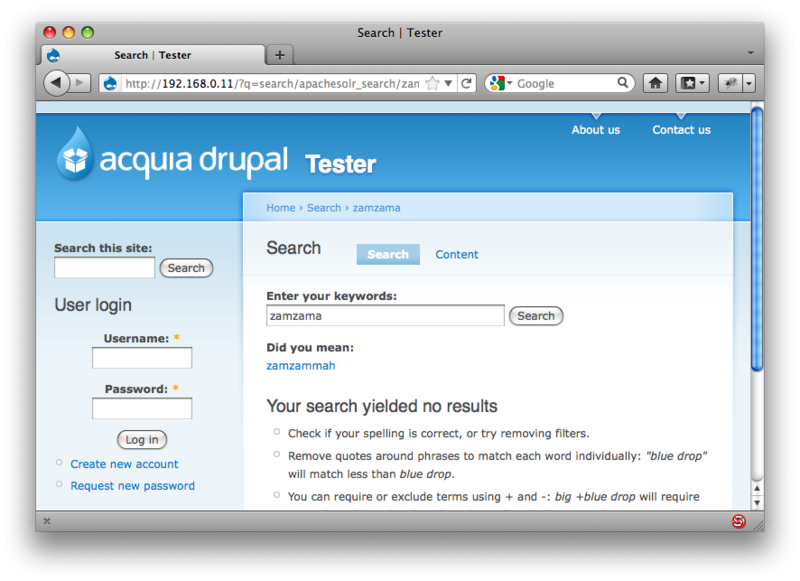 I will assume that you are using Acquia’s Drupal (which ships with SolrPHPClient). Warning: This article assumes all services are on a single machine (suitable for a small organization). Running Solr on a separate machine is possible but raises security implications that are outside the scope of this article. Notice the hashmark (#) as my terminal prompt. It denotes that I am executing all these commands as root (use ‘su -‘). You can also prefix the following commands with ‘sudo’. In the future, when you upgrade your software, install the Solr upgrade and update the symlink. Each domain has its own Solr indexes located in ‘data‘ and its own configuration files in ‘conf‘. There are two optional directories: ‘bin‘ (for replication scripts) and ‘lib‘ (for plugins). Unless your other apps use them, chances are they will be missing. You should already have Acquia Drupal 6 running or Drupal 6 with the ApacheSolr plugin installed. You can copy the ‘protwords.txt’, ‘schema.xml’, and ‘solrconfig.xml’ files from the plugin directory in your respective distribution rather than downloading it, but adjust the paths accordingly. If you don’t already have the ApacheSolr plugin, get it from the Drupal web site. If ur root cp may give u a scary msg next cmd! Ignore it! Y to overwrite! Fix group so tomcat can use this! Warning! If you are not using the Acquia distribution and instead installed the ApacheSolr plugin from the main Drupal web site then you should check that you have a copy of the SolrPhpClient (version r22 – see module README for the gory details). The Acquia distribution includes the correct SolrPhpClient (so you might want to use that instead?). If the future, to add a new domain, copy the example.com folder you just made and customize it. This will also work for additional domains that you want to support. Tomcat will use these files to find the WAR and deploy the application using the settings in the Context. Note: Contexts can be overridden (they often are) and there are more than a few in Tomcat. Review Tomcat’s documentation if they give you any trouble. Make sure your Context fragments have .xml suffixes! The Context fragment is simply telling Tomcat where to find the Context root (document base). It is an absolute path to its web app archive (WAR) file. CrossContext allows Solr to get a request dispatcher from ServletContext.getContext() for access to other web apps on the virtual host. The Environment tag defines the ‘solr/home‘ setting and allows it to be overridden. That’s all you need. By default, Tomcat listens on port 8080. The default iptables ruleset in CentOS 6 does not allow remote connections to port 8080. For our purposes this is fine since we want our Drupal sites to connect locally on port 8080. Local good, remote bad. 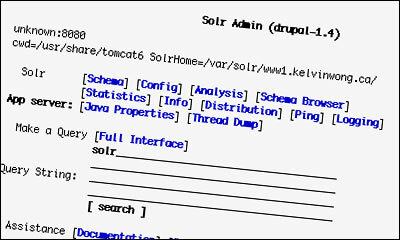 Solr is a web service that takes many requests from Drupal using the HTTP GET method, similar to you typing into your browser’s web address bar. These requests routinely get very long; you can increase the GET request character limit by increasing the maxHttpHeaderSize attribute (from 8k to 64k as shown). To handle non-English characters, you should also set the request encoding to UTF-8. The Connector as-shown does both. You should now be able to view the Solr administration page if you open a local web browser on the server. 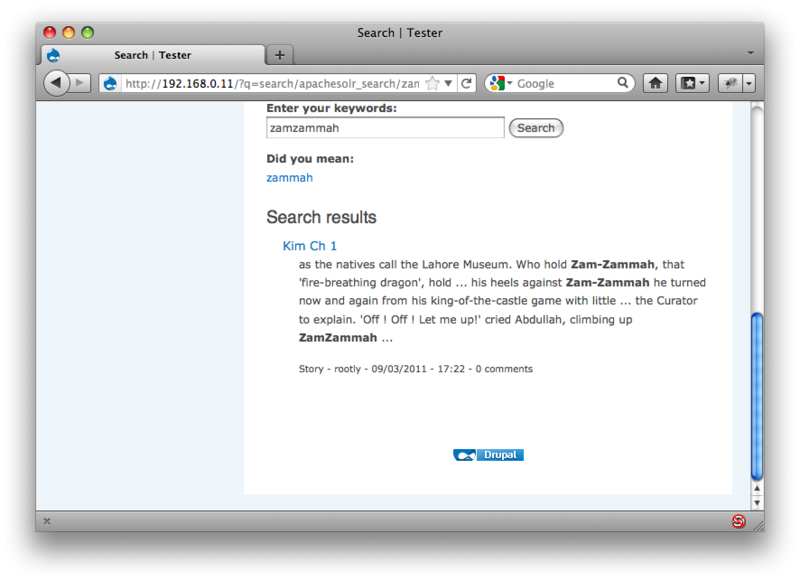 If you don’t have a desktop on the server (as should be the case), you can use a text-browser like elinks. You should see the Solr administration page in your browser. “Apache Solr: Your site was unable to contact the Apache Solr server,” reports Drupal; SELinux chuckles. SELinux has denied the http daemon from connecting to itself or the relay ports. An httpd script is trying to make a network connection to an http/ftp port. If you did not setup httpd to make network connections, this could signal an intrusion attempt. httpd_can_network_relay boolean: "setsebool -P httpd_can_network_relay=1"
The cron job indexes 50 nodes at a time by default. When indexed, you can then search for nodes by keyword. The configuration options have been saved. Apache Solr: Your site has contacted the Apache Solr server. Apache Solr PHP Client Library: Correct version “Revision: 22”. You can re-index the site by force or let cron do it gradually. Either way it take a while for Solr to process the data. Intentionally misspell something and let Solr give you hints! What about the other one??? www2?